Living life with less baggage! The Alps (Mont Blanc on the right) rose like the sun each time we approached the top of the cols, or mountain passes. 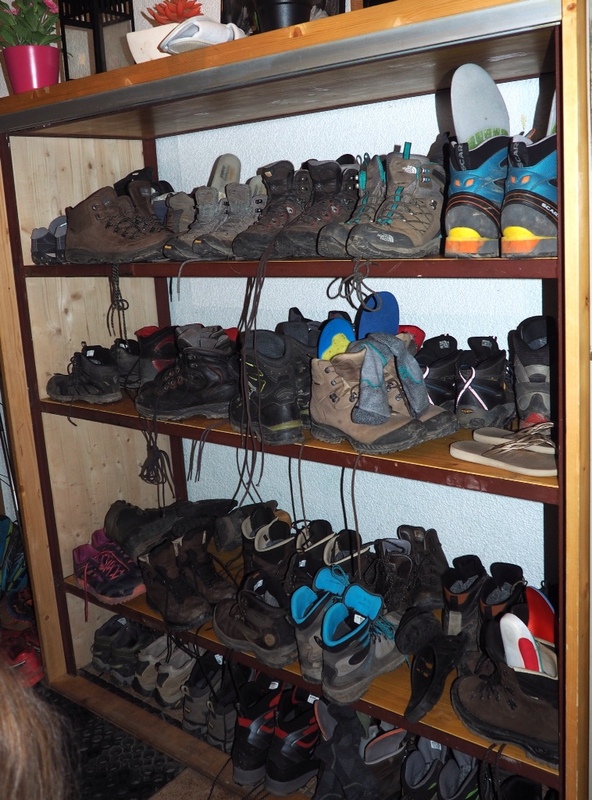 Some accommodations required trekkers to stow shoes and boots downstairs. We knew the weather in the Alps was unpredictable, so we packed rain gear, a warm jacket and lightweight clothing designed for layering. We had two days of overcast and some rain at the beginning, then five days of brilliant sunshine with highs in the 60s, 70s and into the low 80s. Cool nights the entire time. There was a snowstorm (yes, in mid-July) at one of the passes the day before we went through. Later, we had several days of clouds and some rain, but very little precipitation while we were walking. The last couple of days were clear until late afternoon, when rain, thunder and lightning entertained. Bookings. We booked our tour through an Irish company (Follow the Camino) and asked for a mix of refuges (hostels) and hotels. We wanted to stay in some remote locations where refuges are the only option. We got private rooms, rather than shoulder-to-shoulder dorms, in the five refuges. Refuges are rustic, noisier, and not as relaxing as the hotels. They also have shared baths. But, they are great places to meet people. We have met lots of people on this trek and often run into them for several days afterward. Generally, the refuges get quiet by 10 p.m. or so. The hotels on the Tour are nicer and less expensive than chain hotels in the U.S. Both hotels and refuges have bars and restaurants. They are places to hang out after a long day on the trail. 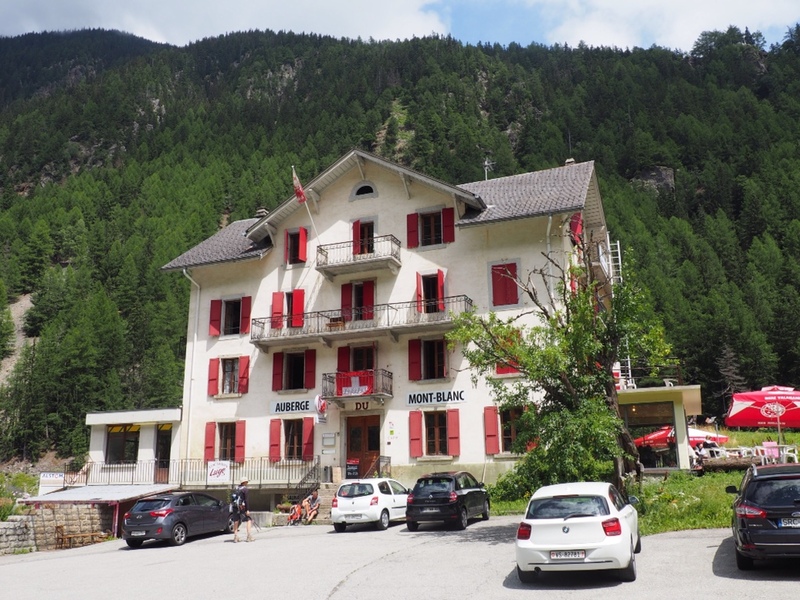 The hotels on the Tour du Mont Blanc have character and the staffs have been very welcoming. All our accommodations included breakfast and eight included dinner. The dinners have been very good, some superb. The Mont Blanc refuge in Trient was packed with at least 70 trekkers, but we met some great people there. 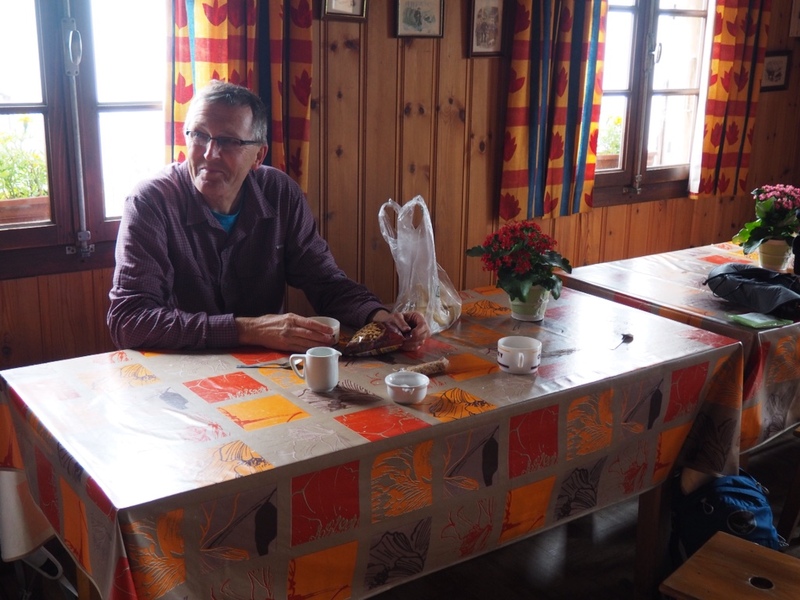 Le Dahu Hotel in Argentiere had the best bathroom and a great breakfast. What about clean clothes? We use moisture-wicking athletic wear that dries quickly. We often do some laundry in the bathroom sink, wring it out in a bath towel, and it is dry by morning. 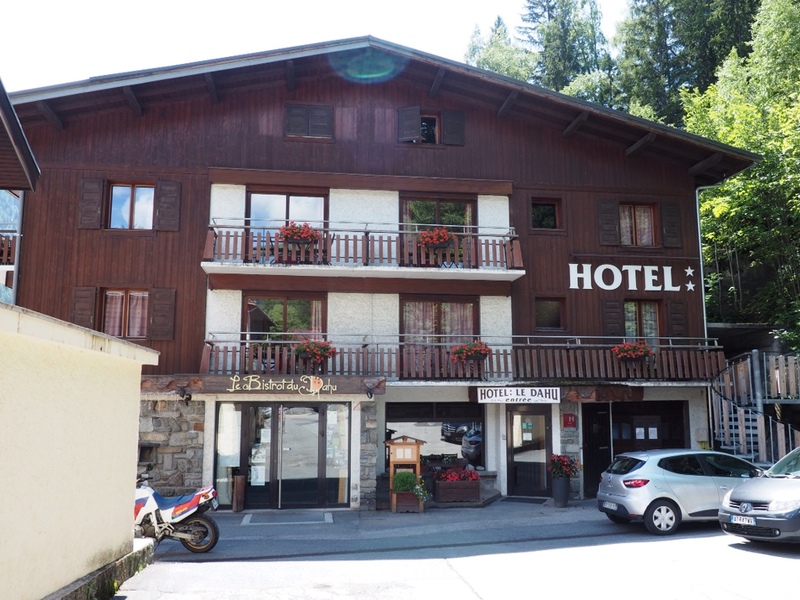 In Courmayeur, Italy, the hotel did our laundry for 2€! What’s for breakfast? Always bread, butter, jam, coffee, tea and juice. Wonderful fresh croissants almost everywhere. Most places had cereal, yogurt, meat and cheese. Two hotels had eggs and most had fruit. Lunch was usually a picnic on the trail. The usual fare was fresh bread, cheese and fruit, capped with chocolate. We had lunch at some spectacular settings in the Alps. 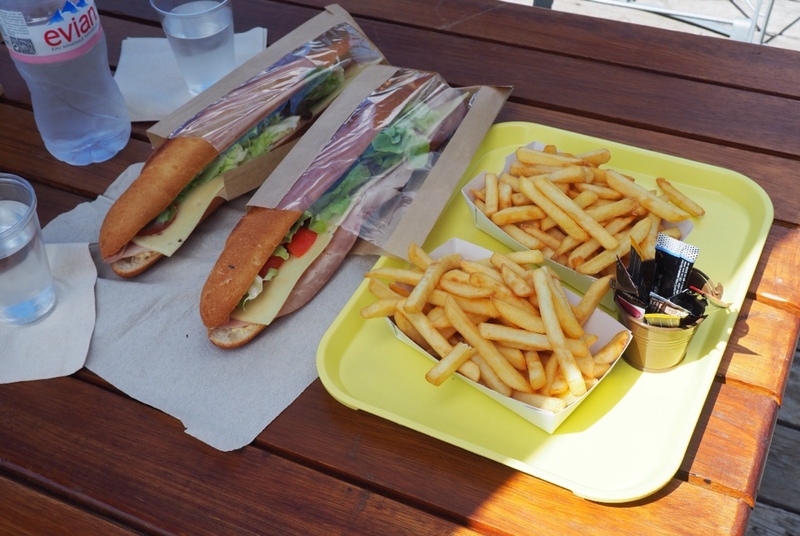 Hotels and refuges offer packed lunches, but we usually shopped for our own. 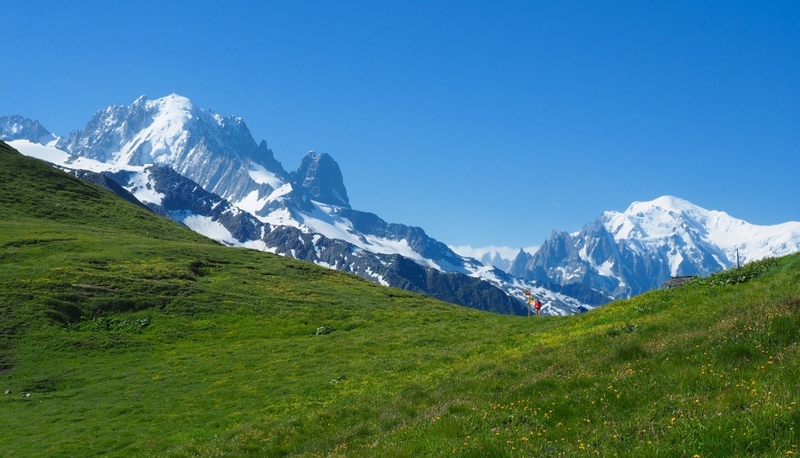 The cost of the Tour du Mont Blanc is much less than most other European travel, but far more expensive than the Camino de Santiago in Spain. Luggage transfer: the routine was to have our small orange-and-black bags at reception by 8 a.m. When we arrived at our next accommodation, we would check in and (voila!) the bags were waiting for us. We carried small Osprey day packs with water bladders during the day. One exception: our bags skipped ahead a day when we stayed at the very remote Refugio Elisabetta. We have carried our own packs on prior treks. We figured the elevation change would make it too tough and we were right. We had climbed about 2,000 feet before having coffee at Refuge Elena, below. We were part of the way to the col when Sue took this photo. This was one of the toughest days, but led us to 360-degree views from the Swiss-Italian border. We splurged for lunch at a ski lodge a few days ago. Skiing facilities were plentiful around the Tour. We have not found language to be a major problem. French is dominant, but most of the time people know at least some English. Sue’s study of French this past year has helped. Many people are doing part of the Tour du Mont Blanc rather than the whole thing at one time. There are quite a few day hikers, especially when the weather is good. 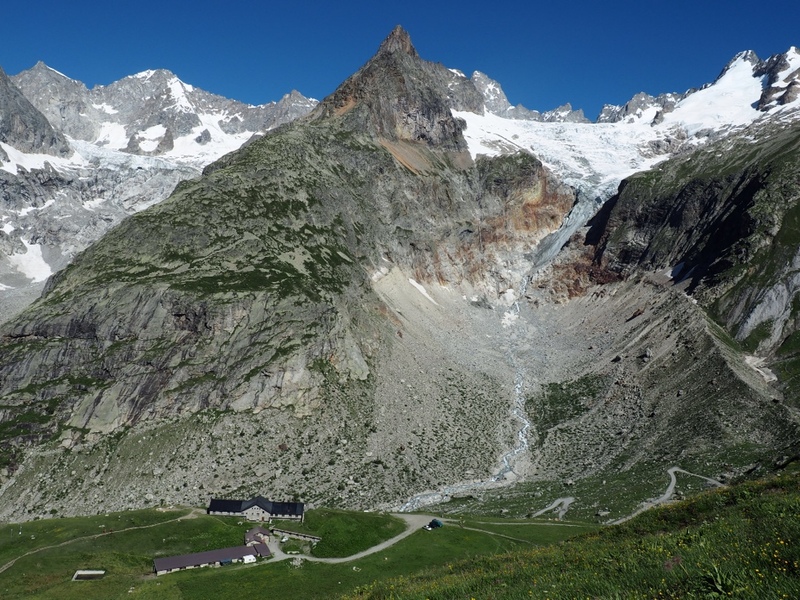 Most go counterclockwise around Mont Blanc, but a significant number go the other way. 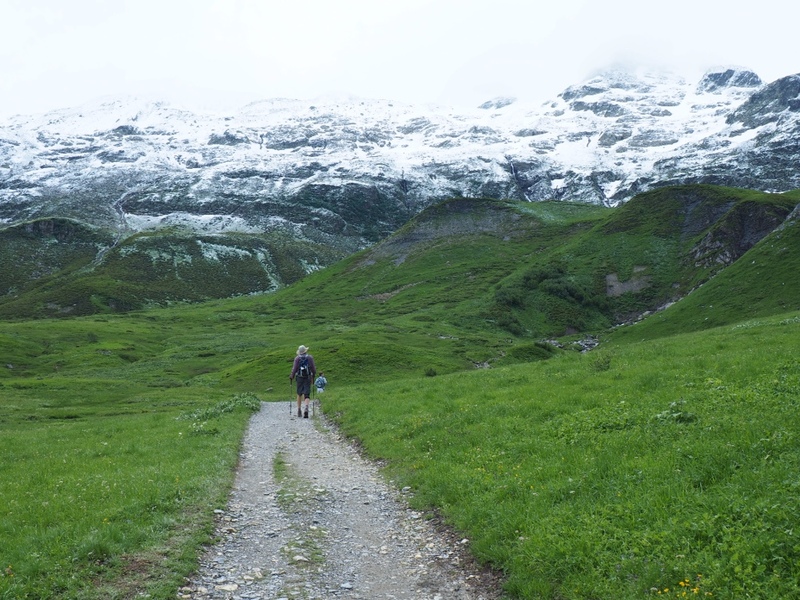 Hikers usually start in Les Houches, but we met many who started in other places. 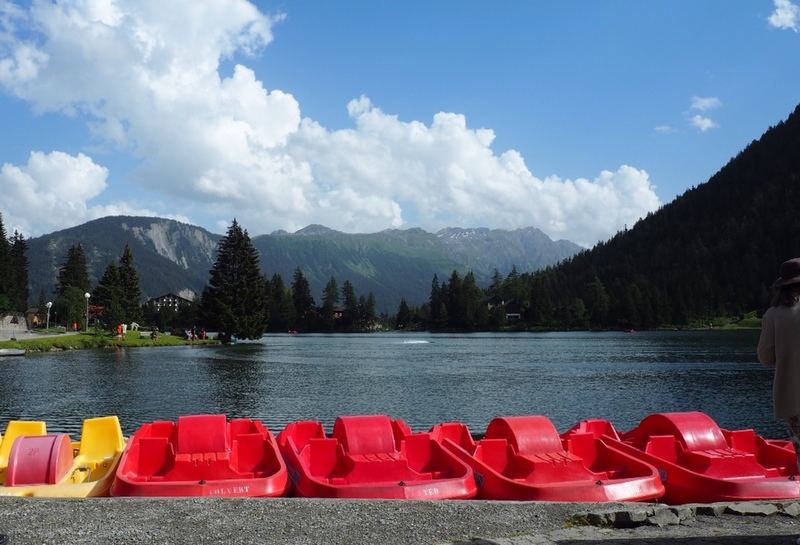 We started in Chamonix, France, a beautiful and popular resort at the foot of Mont Blanc. Trekkers readily engage strangers on the Tour. Friendships form quickly, much like the Camino. Mont Blanc trekkers come from all over world. Europeans dominate, but there are some Americans, Canadians, Asians, and people from other parts of the world. Many travel in groups, some with guides. We are among the older trekkers here. Many seem to be experienced mountaineers and we have seen a number of people running (yes, running!) the trail. They are likely training for the annual Mont Blanc run in August, when some do the entire 110 miles in between 20-plus and thirty hours. There are also a fair number of mountain bikers. We have seen some who push and carry their bikes up several thousand steep feet and then ride down. There are a small number of campers as well. Almost all refuges allow picnics, especially if you buy a beverage. Champex, a quaint lakeside village at 5,000 feet, was one of our rest days. Like much of the Swiss part of our trek, places were strangely deserted. Our hotel owner told us the euro's decline has hurt Swiss tourism. It is much cheaper to travel in France, Italy and other countries, she said. Most people use trekking poles. Sue and I can’t imagine not having them, for many reasons. But, we have seen people doing the trek in running shoes and even sandals. Go figure! Few people on this trek wear hats. Safety. If you are careful and have proper gear, this trek is safe. There are steep drop offs and the ascents and descents are steeper than we expected. Much of the time, each step must be measured on the often rocky and root-covered paths, which takes a lot of concentration and is exhausting. Some of the water crossings have been challenging, but doable. Some trekkers use crampons over snowy passings. Neither of us fell during the trek, but there were a few close calls. Most of all, the astounding views and the chance to meet so many interesting people were worth every step. As Reg looked up at the snow, he wondered if we had gotten into more adventure than we expected. This was near the beginning of our trek. Wow, what an amazing trek. Thanks for a most informative recap of your adventure! Thank you, Cathy…Sue showed me photos of your Mammoth trip and of the guys’ hike. It looked like you had a good time! That last picture of Reg looking up at the looming snow capped mountain – leaves me breathless! I have to admit, Cathy, I was quite intimidated, but there was no turning back. Great synopsis! I had the same political questions while abroad this summer. Beautiful photos. Thanks. Thank you, Cynthia. Heading home tomorrow, via Iceland. Thanks Ellen…and thanks for cheering us on!